Use the power of Citrine to increase your success! 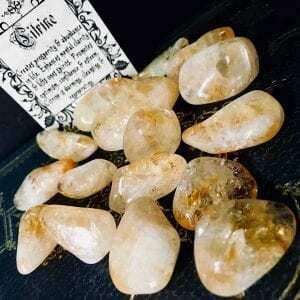 Citrine Magic is a must for any business owner as the crystal itself has the ability to attract wealth, success and abundance. Because it has such magical properties attached to it, some call it the “Merchants Stone” and works best for those who are generous with their good fortune. Try adding a Citrine crystal or two to money spells or business divination readings to gain a financial advantage! When it comes to Citrine Magic, it is strong in bringing positive and uplifting energy to a person. And since it is full of light and warm energy, it helps with banishing any negativity and balancing out ones emotions. Because Citrine is so full of positive energy, you will find the positive energy dispels any stagnant energy that may attach self to it. Which means, no cleansing needed! however, to be on the safe side, it is still always a good idea to cleanse any crystals before using them. Keep out of direct sunlight as sunlight will fade it’s rich golden colour. Always cleanse your crystals before any form of spell casting. This can be done with various purification herbs or crystal clearing incense. Once the Citrine Crystal has been cleansed, recharge it by placing outside or on a window ledge where it can greet the rising sun.